This is just gorgeous! It is funny to realize that exactly half the fabrics are black. It doesn't seem at all dark! Your quilting looks great! I love the colors with the black background, I hadn't thought to make one with black. 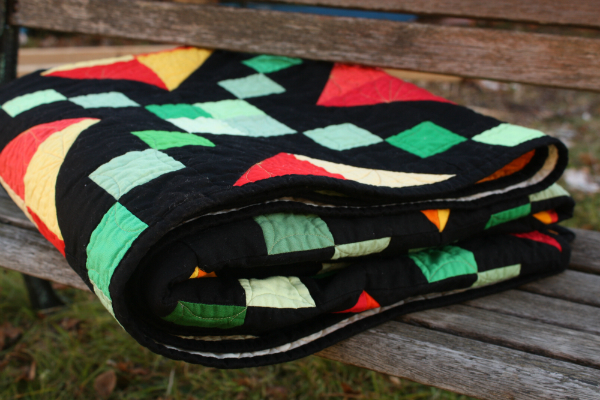 I totally stared at the quilt; you are right that I would never guess it is half black - how cool! Congratulations on getting this quilt finished and gifted; I hope they love it. Oh, its stunning! I agree, the bright colors do stand out against the black, making the black look less prominent. I think those were perfect color choices. 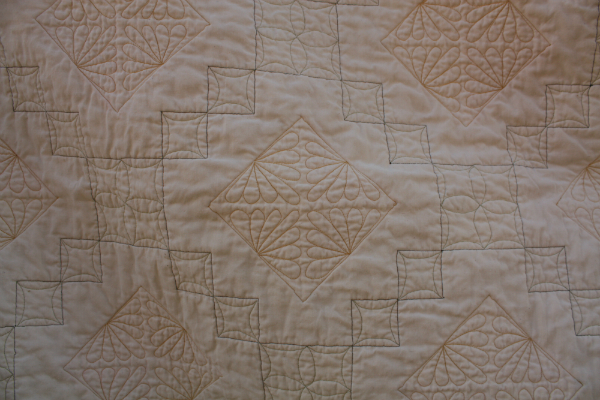 The quilting is fabulous to - I'm amazed you made the quilting on the triangles so symmetrical freehand. Beautiful! Amazing! I love the colours. It doesn't seem possible that half is black -- you barely notice it with all the great colours. Great finish. I love your quilt, and that's it such a play with colour, beautiful quilting! This looks stunning on a black background, and when I compared this to your orginial link, I almost didn't recognize it! What a lovely present for your brother and his wife... I'm sure that they are over the moon thrilled about it! The quilting looks very nice, and it was a good choice to not quilt the black. Bravo Leanne! This is such a beautiful quilt. I love the way those brights look against the black background. And the quilting is simply perfect! Just gorgeous! Very striking quilt--I know they will love it! Woo hoo! Great finish, Leanne! I'm sure your brother and SIL will love it. Such bright fun colours pop wonderfully against the black. The colors really do pop against the black. I was surprised with your observation about it being half black and started running through (in my mind) how each of the colors would be added... and of course, you're right. That's so cool how the finished product is more than the sum of its parts. A beautiful wedding quilt Leanne! The colors you combined are gorgeous! I love autumn. And the quilting looks just perfect! 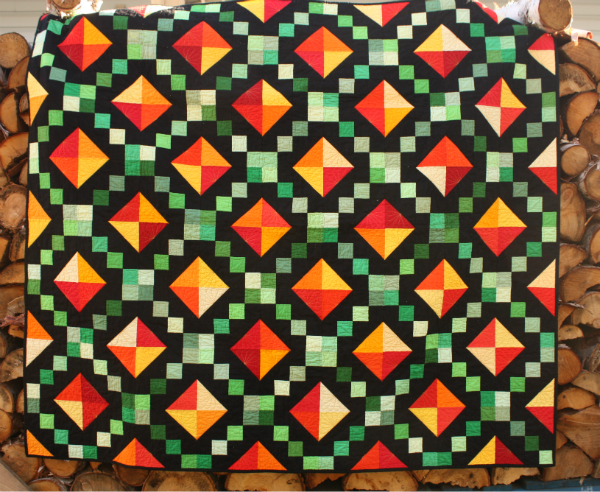 A lovely quilt with great colour choices. 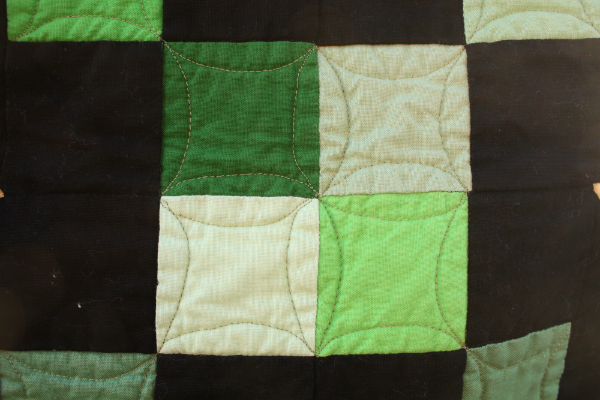 The black is what makes them pop so well and the quilting is great too, I enjoy that kind of quilting myself. 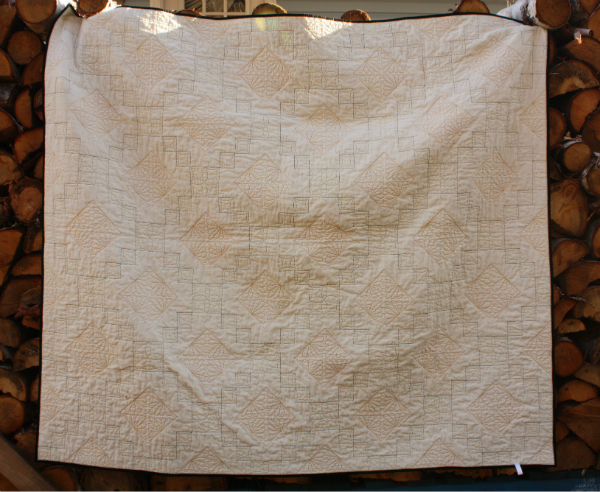 Goodness, Leanne, that is one gorgeous quilt! Whoop whoop!! You are right. It doesn't look 50% black. 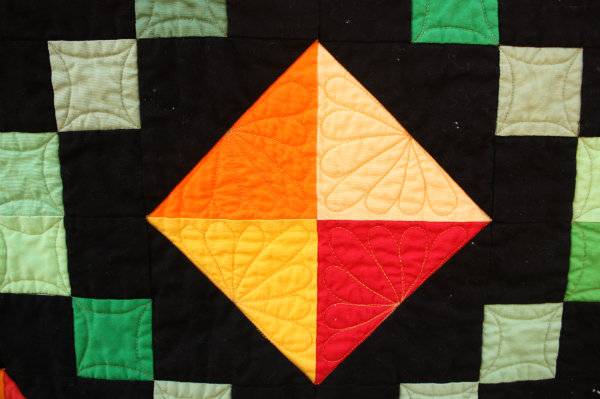 I love how the bright colors pop and show off your quilting.